I worked for many years as a science teacher in Toronto, Ontario, and now am an occasional teacher working in the local school board. My eldest son has come home twice now with instructions from a teacher to build a mousetrap car. There is a lot on the internet that provides video and instructions. The following is the result of the modifications made to various designs seen and improvements made from the first try to the most recent version of this vehicle. A warning: mousetraps are delicate instruments of death to the unwary mouse. Even following the instructions given may result in fingers being snapped accidentally and it will hurt. Slow and steady, as they say, wins the race. Following these instructions but working slowly and carefully and having an extra body around for assistance should reduce or eliminate finger or other bodily damage! 1. Drill two shallow holes on each of the short ends of the mousetrap about ½ inch in from each end. 2. Screw in the eye hooks, one into each hole. 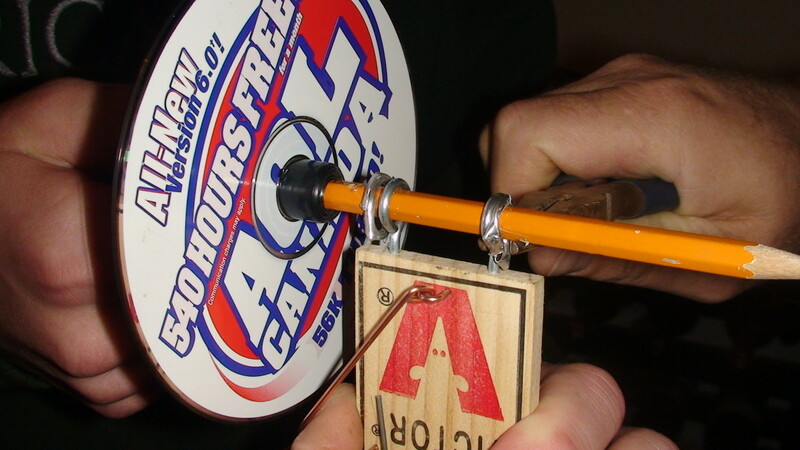 Make sure the eye hooks are level by placing each short end of the mousetrap against a hard cover book. 3. Using wire cutters, cut the square snap bar where it attaches to the middle bar to the right of the mouse (red V). This step will give greater leverage and greater potential energy when launching the vehicle. 4. 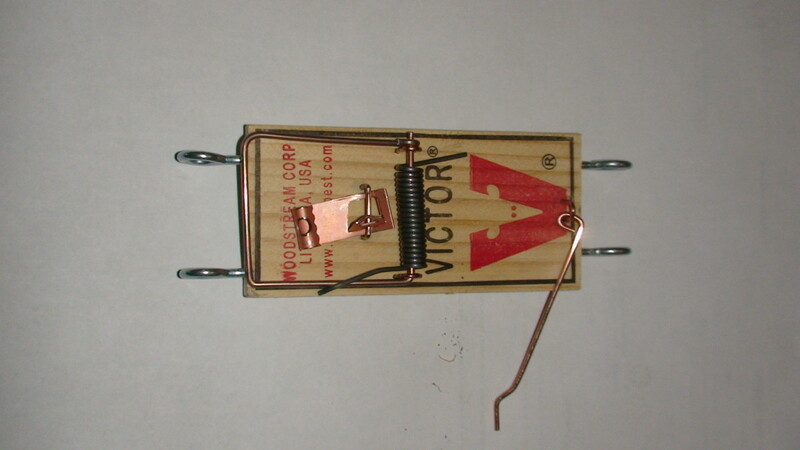 Using pliers, straighten the bar so it is parallel to the long side of the mousetrap. 5. 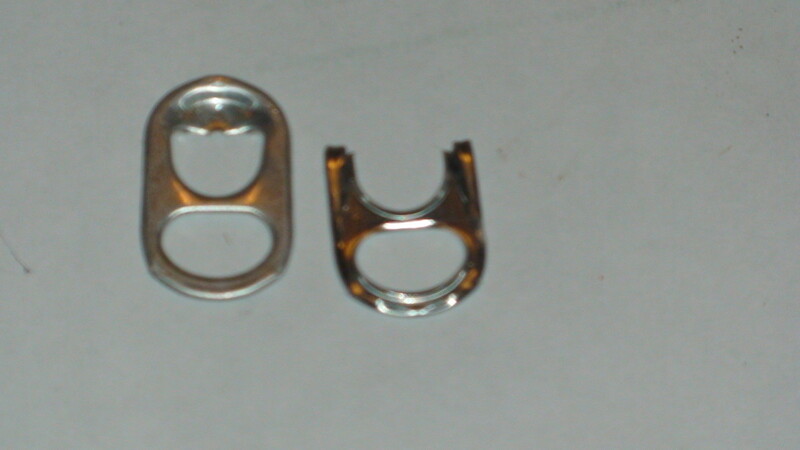 Cut the tops of two pop can tabs (where they attach to the can). Bend the cut tabs in slightly. 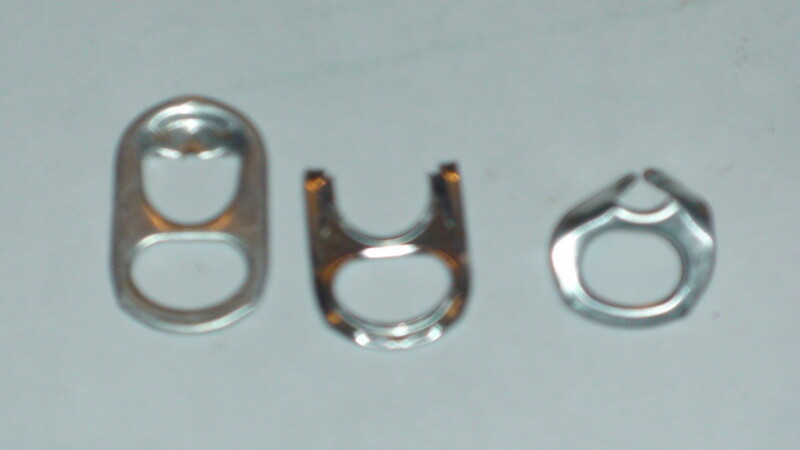 These bent-in tabs will be used to grip the pencil in step 10. 6. Fit a pencil through a pop tab, both eye hooks, and the second pop tab. Center the pencil and mark each side of the pencil about 1 to 1½ inches out from each eye hook. 7. Wrap electrical tape carefully around the pencil at the mark. 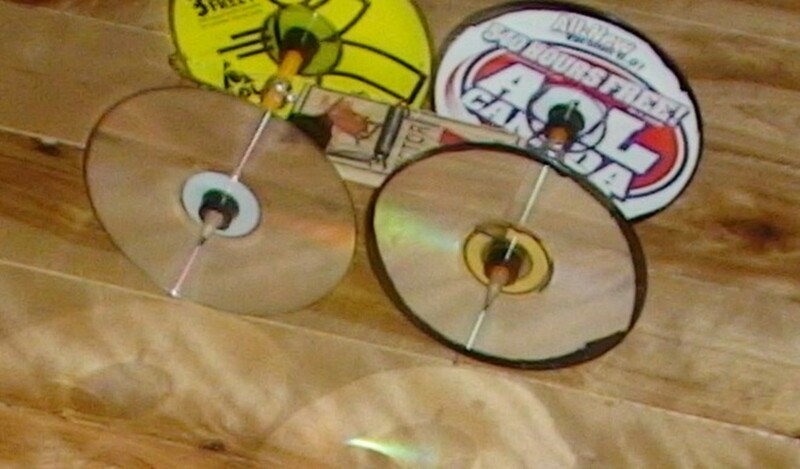 Position the CD hole over the tape periodically and stop wrapping when the CD will fit snugly onto the wrapped tape. 8. Repeat steps 6 and 7 for the other short side of the mousetrap but make sure the interior axle-length of this side is longer than created in Steps 6 and 7. 9. 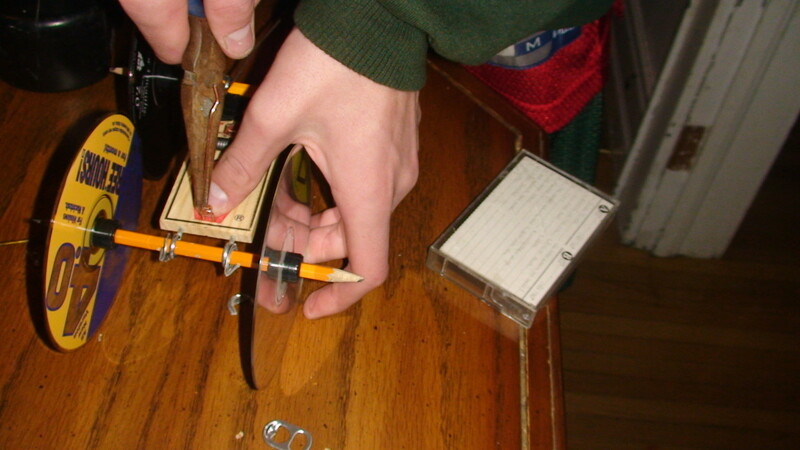 Drill a hole through the center of the pencil (on the 'mouse' side of the mousetrap). 10. Make sure the pop tabs are very close to the eye hooks and then pinch the cut ends of the pop tabs to the pencil to keep the pencil (axle) from shifting side ways. Bend the tabs away from the eye hooks if necessary to allow the pencil to rotate freely. Make sure the pencil can rotate freely. Repeat this step with the other two pop tabs for the opposite axle. 11. 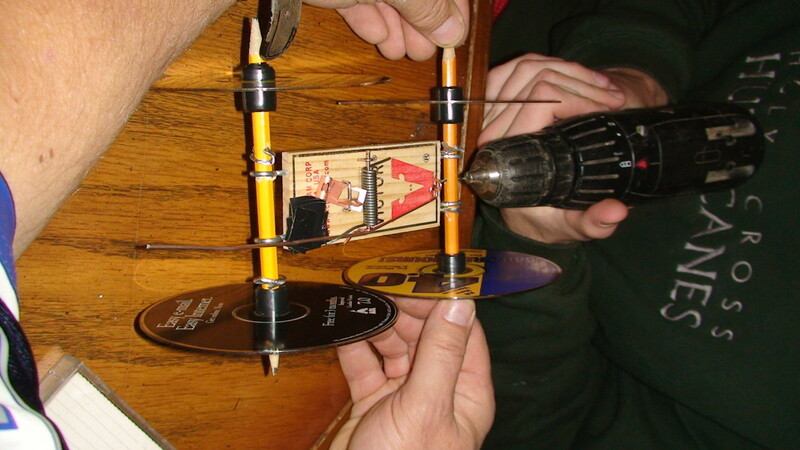 Using pliers, straighten the bar from the point it meets the top of the mousetrap towards the inside so it will not interfere with the motion of either wheel. 12. Measure the fishing wire from the tip of the bar to about two inches past the tip of the mouse's nose. 13. If you have not already done so, remove the straight bar anchored at the tip of the mouse's nose. 14. Cover the edges of the back wheels (mouse points to these!) with electrical tape to reduce slippage at take-off. 15. Slip the fishing wire through the hole drilled through the pencil in Step 9 and knot it securely. 16. Make a loop at the top of the straight bar. 17. 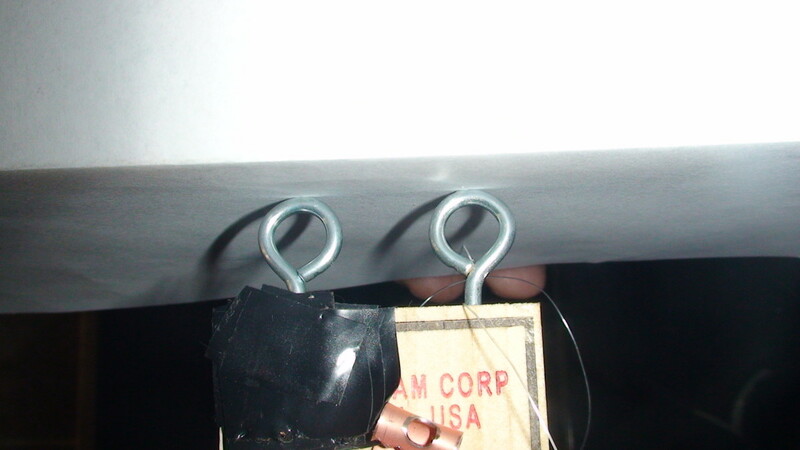 Tie the other end of the fishing wire to the loop at the top of the bar and secure it with electrical tape. 1. 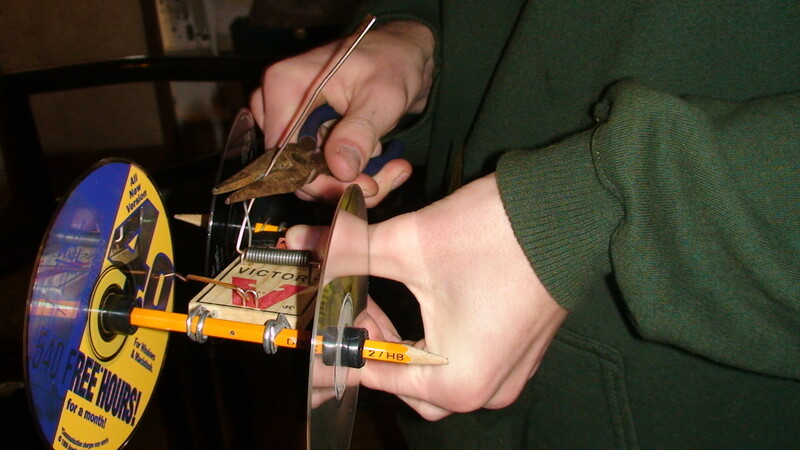 Rotate the back wheels slowly to wrap the fishing line around the axle (pencil) until the line is taut. 2. Pull back the bar and continue winding again until the wire is taut (potential energy for the vehicle is obtained in these steps). 3. Hold onto the back wheels and place the car onto smooth ground in an area where there is ample room (at least 20 feet of horizontal distance). 4..Let go of the wheels and watch your car speed away. 5. If the car does not travel in a straight line, adjustments must be made. Check the pop tabs to make sure the axles cannot move from side to side. Ensure that the axles are aligned properly. If you did not ensure that the eye hooks were level with each other your vehicle will not travel in a straight line. Most importantly, have fun! Rome wasn't built in a day and your mousetrap vehicle may not be built in an hour. Part of the fun is tweaking your vehicle to make it work better and more efficiently. Modifications to the design presented here are possible. GOOD LUCK! This is very interesting. I found this page quite useful. I've done other mousetrap cars in the past, but no other works as well as this; I got passed 47 feet! Thanks Teresa. why are the wheels too close? Look for a mouse symbol where the snap bar is. Cut the snap bar at a point just to the right of the mouse symbol. All you need to build one is in the hub. What other information do you need? Let me know exactly what other information you're looking for! I'll see what I can do. hey please tell me about a mousetrap car. Mine went over 21 feet! how far does it go? past 5 feet? Imthatgirl, retread steps 9-17 again. The information you need for attaching the wire to the pencil is there. You can try string but fishing wire will be lighter, more durable and create less friction when launching the car. Good luck! Bishop55, I hope you get a chance to try this project out. It is a very cool science project. I gotta try this with my stepson! Voted up. You need pics to help my son understand it better (he's a little slow). rose-the-planner, so glad you enjoyed the hub. Try to make one some day. 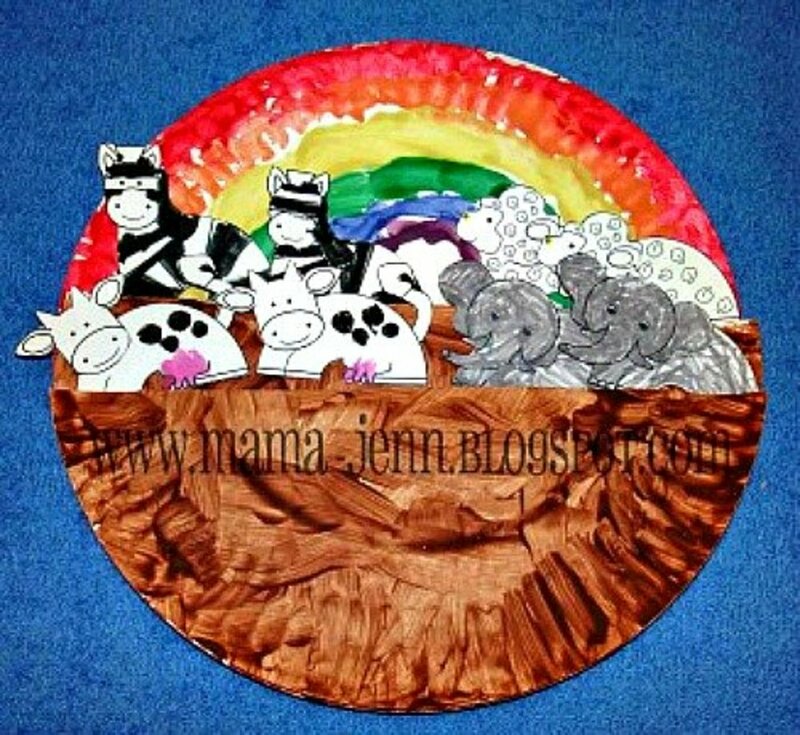 They are not only educational but a whole lot of fun! Glad you found the hub useful tj! Eric Calderwood, glad you enjoyed the project. I hope you get a chance to try it out. Thanks for commenting, cheers! lorddraven2000, so happy that you've found an interest in this project. It does take some persistance to get it together but the resulting car is well worth the effort! Hope you get a chance to use the idea! Let me know how it goes! Very interesting to say the least. I really have been considering doing something like this as a science project for some of the local kids who visit the library here. This was informitive and you described the steps really well. Thank you. What a neat idea! 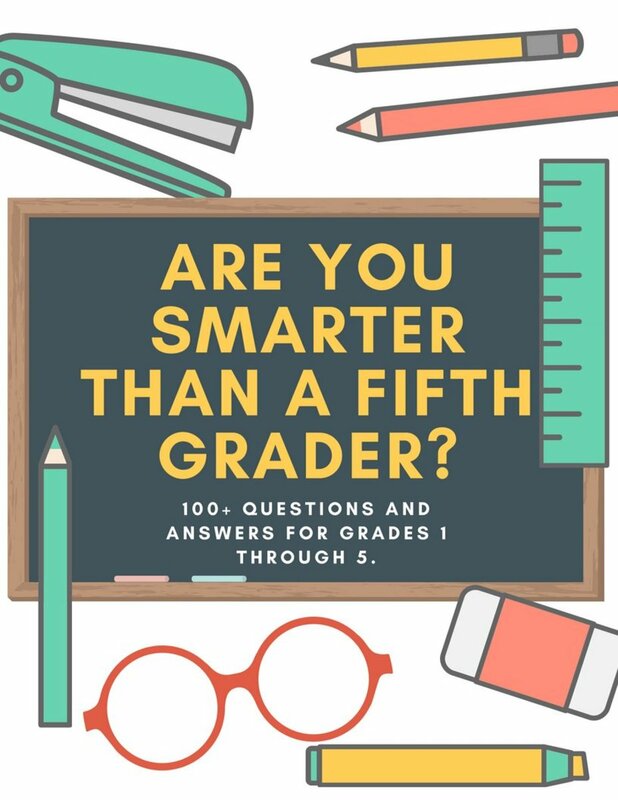 I love finding science projects online. I am amazed at the ingenuity in some of the designs that I find. This project is no exception, great job! Amyiscool, I have smashed ours against a wall without any damage. But obstacles will certainly reduce the length your car will travel. Be sure to clear a path in front of your mousetrap car. Obstacles may break the fragile design. Awesome arod, I am so glad it worked out for you! Congratulations on the great mark!!!! Thank you Teresa for your Mousetrap Car design, I really appreciate it!! My car works great and it went over 25 feet! The electrical tape worked as an alternative for the pop caps. And I made a 100 for the car in my Physics class. That sounds like it would work. Try it and see. Electrical tape will be easy to remove if it is not the right solution! Could I wrap electrical tape to the left and right of the wheel axles' because I can't get the pop tabs to stick to the pencil? Screw eyes do come in varying sizes. 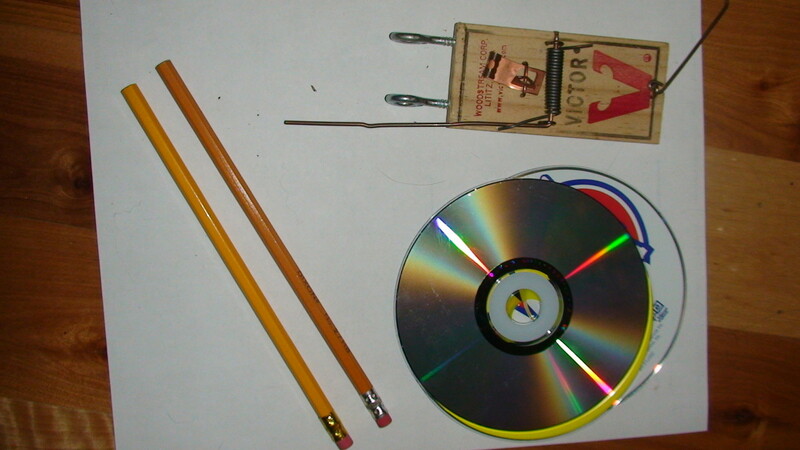 Can you fond some with a smaller screw diameter or if that fails, mousetraps also come in larger sizes. Perhaps you could find a larger mousetrap of the same design? Good luck arod356! I'm having issues with the screw eyes. 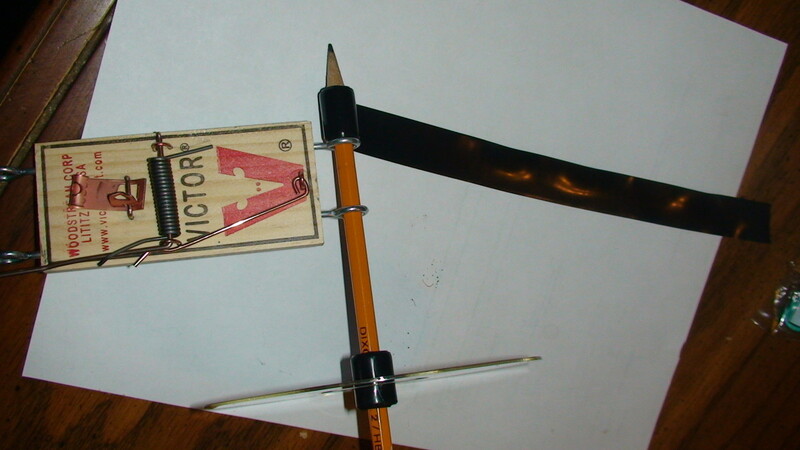 The pencil fits it in, but the screw diameter is too big for the mouse trap and it ends splintering up the top of the mouse trap. Thanks so much Daisy. My son loved the challenge of making one. It wasn't easy but the resulting vehicle worked great! Hope your cousin's sons enjoy the project! This looks like a fun project! I'm going to tell my cousin about your article. Her sons will love to make the car. Not quite sure but I'm sure it is possible. It would make a great next hub miranda but I'm not in a position to work on this idea at the moment. Good luck! Hayley, that will depend on the size of mousetrap you buy. The instructions will work for any size mousetrap of the same type illustrated. You would need to make those measurements yourself as they will be unique to your own mousetrap. Good luck! what is the length in the car, height, and also the width? That you would have to experiment with yourself. Good luck, I'm sure there is a way! Is there a way to make this go reverse 1 meter? You are so right HG432. First time anyone has caught that error. Thanks for that. And yes, you do need 4 pop tab! Now I get it. Can you find something straight, like a smaller diameter wooden dowel that will fit through the hooks? It doesn't have to be pencils, just something that will work like axels. For this project do you need 4 pop can tabs because it says to repeat the step on the other side so does that require 2 more tabs? Well i got open hooks and they do fit into the trap but it doesn't work with the pencil? What do I do? Not sure unless I know what kind of hooks you bought. If they are small and can screw into the mousetrap then they should work. I accidentally got the wrong type of hooks and I can't go get other ones... so what do I do? Can I still make it work? Our room was only 26 feet but the car was gaining speed when it hit the wall. I am sure you can go much farther than 30 feet with this model. Good luck! This looks like a great tutorial!What is the average distance this design is expected to go? My project is required to go at least 30 feet. SOrry kk I can't as the car got handed in as a project and I don't have time to make another one as well as video. Work on it and if you have questions, I check my comments very frequently and might be able to provide some clarification. Sorry I can't be of more help! Sorry kk I don't have a video as of yet but it is on my list of things to do. Unfortunately that won't help you, sorry. Have a friend or parent help you at each step. It is a challenging project but if you work slowly and get a partner, friend or parent to help you will be pleased at the results. Good luck. Good luck with your project esai! Thanks for your comment teaches12345. It was a fun project to work on with our son. I'm sure we'll be doing it again! Looks like a fun project. I remember doing the pine wood derby with my son when he was in the Scouts, this looks similar to that learning project. avikadakia , we used wire cutters to cut the snap bar. what did you use to cut the snap bar? Thanks Billy, it means a lot coming from you! Teresa, we did this for several years in my science class, and it was one of the most popular lessons I have ever taught. Kids absolutely love doing this. You are correct tranformicers. Also, for you first question regarding steps 15 to 17, yes you do make a loop at the end of the straight bar with pliers in order to attach the other end of the fishing wire. Hope that helps! w-w-wait I think I got it so... you ummmm... put the line in the hole in the pencil then you tie it on to the straight bar and twist the pencil so the line goes around the pencil and it draws the straight bar back and let it go and zoooooom! right? correct? or am i doing something wrong? NicoNya, see picture labelled steps 3 and 4 above. You remove the straight bar attached to the mouse nose. 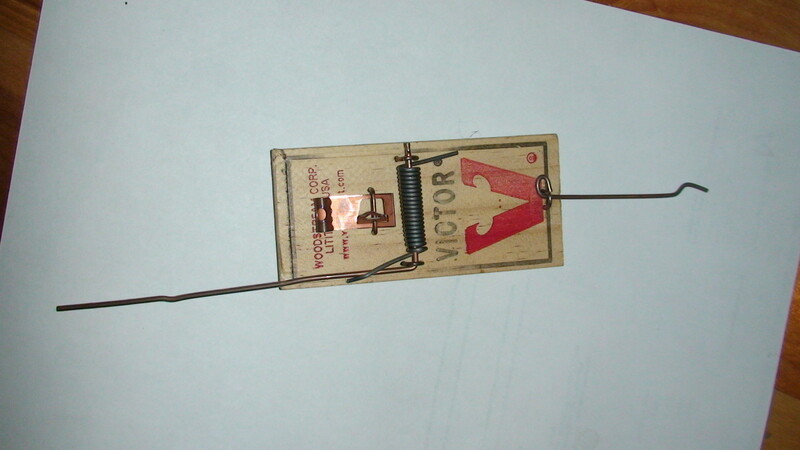 The opposite side had a bar forming a square on the original mousetrap. This bar is straightened and a loop is formed at the end. You attach the other end of the fishing line to this loop. I am extremely confused on steps 16&17. Make a loop at the top of the straight bar? Doesn't it say to remove the straight bar anchored at the tip of the mouses nose at step 13? Or am I mixing up what bars your talking about?Also, can you show what step 17 look like? Or something? Doesn't seem very clear to me still either. What was the purpose for drilling the hole in the middle of the pencil? Person 112, good luck and take your time for each step. It is a great project! wow this is great im going to do this for shop class, thanks! Thanks so much. My pleasure. I'd appreciate an email to hear how he did. If he has any questions feel free to leave more comments here. I continually update this hub when users find difficulties making some aspect of the project work. Good luck. It is an amazing project when it works well! I showed this to my son and he said this will be his science project this year. Thanks for the clear step by step instructions. This is SO cool. The room was 26 ft long and it slammed into the wall so I suppose it would have gone a bit farther. Dasda, bend the end of the straight bar into a loop. Tie the fishing line to this metal loop. and what do you mean you made a loop at the top of the straight bar? with the string? Please help me. Are there any clearer instructions as to hoe to tie the string and to what? The saying goes, 'There's always more than one way to skin a cat"! Glad you got it to work FootyFreak. Sounds like it moved pretty far! Glad the hub helped. I've accidentally drilled a hole for the fishing line not on the pencil but just in front of it (on the trap). Don't know if that matters? But have worked around it with some fine-tuning and it goes 4-5 metres. Thanx for all your help!! ours was able to travel at least the length of a 26ft room. Check yo make sure the arm is straight and that you have a long length of fishing line. it has to be wound tightly around the back axle pulling the arm down with it. You need a lot of force to propel it forward when you let go of the back wheels. How far did yours go? Mine's not going over 2 metres. I must have gone wrong SOMEWHERE?? Glad my hub was helpful FootyFreak 10. Thanx! helped me with my school project!! bigdee, hope you gave it a try a persevered. It is amazing when your final project takes off like a shot! tcsmallz, it does take patience to put this together and may require modifications to get it to run straight and well but the effort is worth the final result. I know that for many physics classes, this is a yearly project. Hope you try again!